I had always wondered when I would be fortunate enough to happan across an event worthy of my putting my life at risk in order to take a once-in-a-life shot. Well, I finally had such an experience. 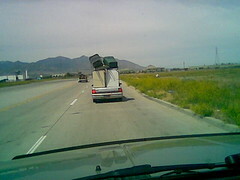 On my way to a lumber store the other day, I ran across someone either in the middle of a move, or doing their laundry on the go. I really tried to get a side shot of this but was not successful.